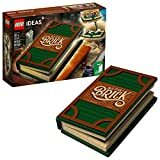 When people talk about LEGO sets that are worth several times as much a year after they bought then, sets like this LEGO Ideas Pop Up Book are what come to mind. Unique concept, brilliant design, and exclusive minifigures. This set has it all for fun and for collecting.